Warren Edward Buffet is also known as the Oracle of Omaha. Warren Edward Buffet, is one of the richest and most successful investor of all time. He was born on august 30 1930, in Omaha, Nebraska. Born to Howard and Leila. PATEL NAGAR, India - April 9, 2016 - PRLog -- Born to Howard and Leila, he was the second of three children and the only boy. As a child buffest demonstrated keen interest in stocks. At the age of 11 he made his first investment. At the age of 26 he formed Buffet partnership limited and by the age of 35 he became an integral part of Berkshire Hathaway. Buffet was raised in a period of great depression of Nebraska. Like many other children who were raised in the period of great depression, he learned the value of money. From an early age Buffet exhibited a keen interest in financial and business matters. Buffet's father was a stock broker and Warren used to visit his father's stockbrokerage shop to chalk in stock prices on blackboard in the office. At the age of 11 he made his first investment, buying share of Cities Service for himself and three for his sister Doris. At the age of 13 he got his first job as paper boy and in 1944 he filed his first tax return. At the age of 14 he invested his saving in 40 acres of land, which he later rented for profit. During his high school, he and one of his friends purchased a used pinball machine, ensured they were in working condition. And they installed them in a barbershop, within few months they were able to buy two more machines, in order to make more profit. But later on he sold this business for $1,200. Buffett began his education at Rose Hill Elementary School. In 1942 Buffet and his family moved to Fredricksburg, Virginia, as his father was elected to U.S house of Representatives, where he finished elementary school, attended Alice Deal Junior High School and graduated from Woodrow Wilson high school in 1947. At the age of 16 Buffet enrolled at university of Pennsylvania. He wanted to focus on his business ventures but he enrolled due to pressure from his father. He stayed there for two years and joined the Alpha Sigma Phi fraternity. But after two years he was transferred to University of Nebraska, where he completed his Bachelor of Science in Business Administration. After being rejected by Harvard Business School, he went to Columbia Business school for Master in Science in Economics. And there he studies under legendry value investor Benjamin Graham. He earned Master in Science in Economics from Columbia in 1951. Before he joined Graham-Newman Corp. in 1957, as securities analyst to work under his mentor Benjamin Graham, he worked at Buffett-Falk & Co as an investment salesman. In 1956 Buffet launched Buffet partnership Ltd. in his hometown of Omaha. By using the skills and techniques he learned from Benjamin Graham, he was able to make huge profits by investing in undervalued firms. And that's how he became a millionaire. One of such undervalued firms he invested in was Berkshire Hathaway, a textile manufacturing company established by Oliver Chace in 1839in Valley Falls, Rhode Island. In 1962 he began buying stocks of the company and by 1965 he assumed control of the company. But instead of expanding textile business, he used cash generated from the business to fund other investment like buying assets in media (The Washington Post), insurance (GEICO) and oil (Exxon). During this phase he turned seemingly poor investments into gold. And eventually in 1989, when he became director of the company, Buffet shut down the textile business. He remained the director of Berkshire Hathaway till 2006. In between he also served as the director of Citigroup Global Markets Holdings, Graham Holdings Company and The Gillette Company. In 2006 Buffet made an announcement that he will donate 85% of his wealth to Bill & Melinda Gates foundation, which focuses on world health issues. He once said "I don't believe in dynastic wealth". His perspective persuaded him not to give his entire fortune to his children. 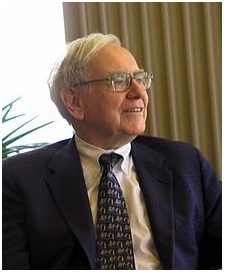 Despite of having a net worth of US$61 billion, Buffett is legendarily frugal. He lives in a five-bedroom house he brought in 1958 for $31,000 and dines at local restaurant. For year he had this idea of purchasing a corporate jet which, when he managed to get, he named it "Indefensible"
How to crack CFA Level 1 exam ?